Eagle Scout Michael Williamson of Troop C221 competes in the NAVY Summit Challenge. 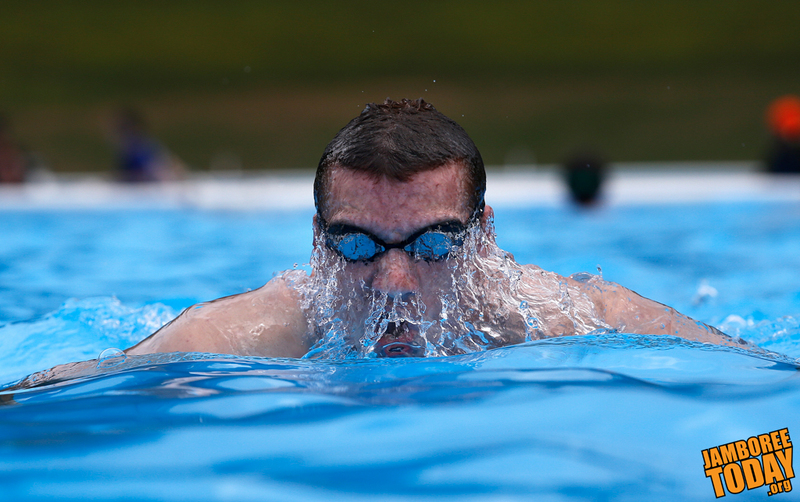 He had a 500-yard swim time of 8 minutes, 40 seconds. BSA Photo by Tom Copeland. Scouts stood in line try their best to look confident. Asked if he thought he would be able to succeed, Ryan Vimba of Ridgewood N.J., said, "I don't know, but I'll give it my best try." Navy SEAL Capt. Duncan Smith explained that the test was exactly the same as the test administered for all Navy personnel trying become SEALS. At the jamboree, the SEAL Challenge allowed Scouts and Venturers to sample the Navy's training, test their mettle and find out if they would make the cut. "We were prepared for a small number passing; we are ecstatic such a large number has passed," says Smith. The SEALS physical tests build on one of their key principles of strength of mind to increase strength of body. Smith says that the SEALS believe "a human is capable of ten times what the body is thought to be capable of." Based upon these principles, the SEALS asked a lot for Scouts and Venturers wanting to pass the Navy Summit Challenge. Even before starting, Venturers were required to have earned the Ranger Award; Boy Scouts needed Star Rank or better, as well as the following merit badges: Citizenship in the Nation, Personal Fitness, Swimming, and Lifesaving. All participants were required to have completed their jamboree curriculum. Whether the participants passed or failed in the challenge, even taking part in the demanding test was an accomplishment in itself. For those who passed, the accomplishment is so much the greater. "I felt proud...because I was the only one in my troop to be here, and I really tried," said Mason Buchanan after receiving his patch and certificate for completing the SEAL Challenge successfully.